It’s still three weeks until Black Friday 2012, but already the tablet wars are heating up. SolidlyStated is taking a break from the “tablet brands you never heard of” series to look at what the big brands have put at the $200 tablet price point. So what is the best $200 tablet for the 2012 holiday? After reviewing plenty of $70 or $80 tablets, these are a breath of fresh air. Update 11/17/2012: Looks like Samsung didn’t have a 16 GB version of the Galaxy Tab 2 7 inch ready for Black Friday, so you will likely see the 8 GB model at a price of $179. Need to know more about Android tablets and what their features are all about? 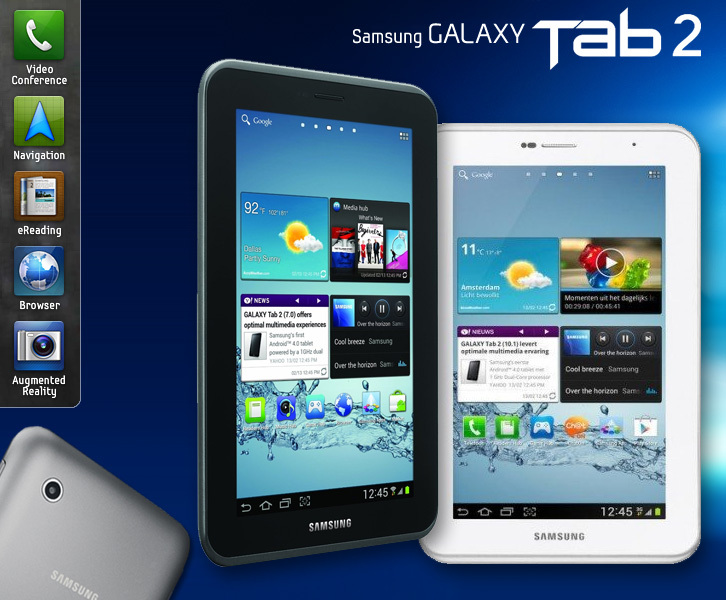 Check out SolidlyStated’s Holiday buying guide for details on what to look for in good tablets. A problem with a lot of comparisons out there are that they are comparing one new device versus older versions of others. Here is an apples-to-apples Nexus 7 VS Kindle Fire HD VS Samsung Galaxy Tab 2 match-up. All 16 GB models Nexus and Kindle Fire HD are 16 GB, Galaxy Tab 2 is 8 GB. All 7 inches. All current for the 2012 holiday season. Each brand has a specific version this holiday season that currently is running at $199.99. As with most hot products during the Thanksgiving and Christmas season, they will probably hold that price and at best be offered with some sort of bundle, like a leather case or a $10/$20 gift card when you purchase it. Watch your versions. Sounds easy, but each of the 3 tablets have multiple versions. “Kindle Fire”, “Nexus 7”, and “Galaxy Tab” all come in multiple devices. Why is the Google Nexus 7 more expensive on Amazon.com? Being an Amazon affiliate, I often link products directly to their website. Not this time… It might seem obvious that Amazon wants to sell its own tablet over Google or Samsung, but it runs on Google’s Android! Today at least, the Nexus 7 will cost you $20 more on Amazon.com than anywhere else. The Kindle Fire HD $199 price means the device shows you ads (they call “screensavers”) on the lock screen. You must buy it for $15 more to get rid of them. Home screen doesn’t rotate – why? Solid Tip: All 3 of these tablets are great buys, especially when compared to all the cheaper off-brand pieces that SolidlyStated has compared. Giving or getting one of these 3 is win no matter which one it is. The fact that Samsung’s holiday entry is 8 GB and will be $179 instead of $199 changes the playing field, so purchase accordingly! I love Samsung. I love the design and the fact that you can choose black or white. It has an awesome rear-camera and a cool universal home remote on it. Samsung also made a great UI with TouchWiz and Hubs. As Black Friday approaches, they are going with pushing their 8 GB model, likely at $179, which means it holds only half of what the other tablets do. Combined with it’s (relatively) slower and lower resolution screen, though, give it 3rd place overall. * Since the lower storage capacity is being offered at a lowered price in most places, it cancels each other out, but does not affect the standings. This tablet rocks. 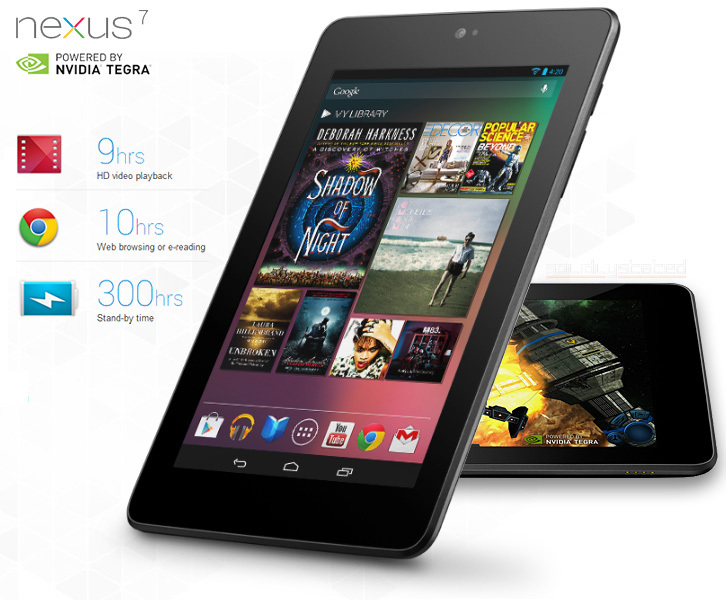 Google and partner ASUS have the most impressive specs with the quad-core Tegra CPU, Jelly Bean OS, and a GPS chip. Unfortunately, the Nexus 7 shoots itself in the foot with bad audio quality, no microSD slot, and no HDMI connection. It is a close second place finish and a definite buy if you love to use CPU intensive apps a lot. 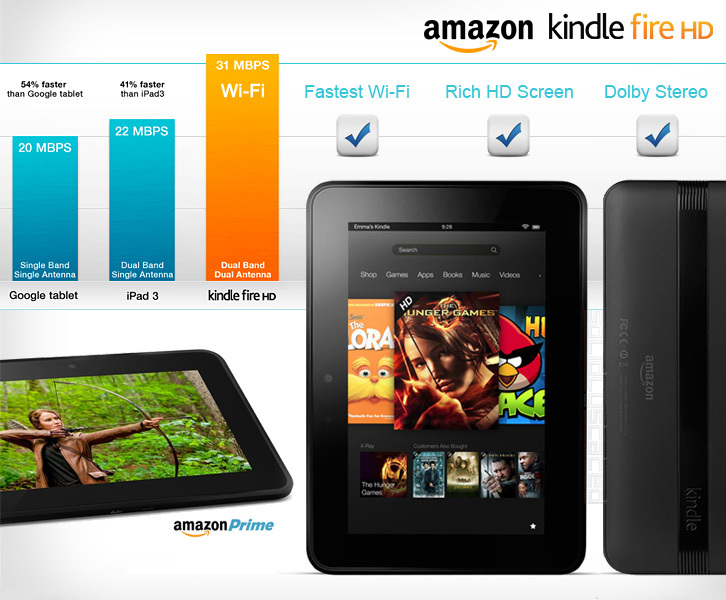 Coming into this long comparison, I thought the Kindle Fire HD would come in 3rd place! After all, it’s a “Kindle.” I was wrong. It has pretty much the best of both worlds with Amazon cloud support and the ability to install Google-specific apps like Google Maps and Street View. You can also install Adobe Flash. Sporting both the best audio and the best video of any tablet under $200, coupled with the best battery and fastest Wi-Fi give Amazon’s new tablet the slight edge to take 1st place in this shootout. It is a very close race, but somebody has to win. While the Fire HD doesn’t have a GPS chip or voice recognition, those seem more important for phones, whereas expandable storage, HDMI connector, and quality sound/video are more important for a tablet device. 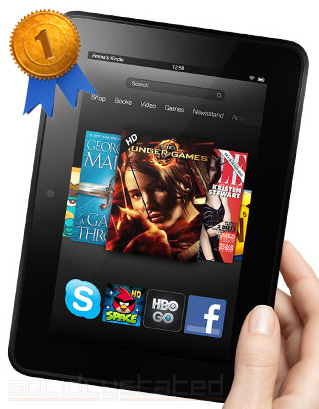 The Kindle Fire HD also comes with one free month of Amazon Prime. Either one will make a great purchase. Order your Kindle Fire HD now, but watch out for that dumb $15 “Special Offers” gimmick. If you want a GPS navigator in addition to a tablet then the Nexus 7 will suite your needs. Google Maps Navigation, although in “beta”, is a very mature product. Caveat is that you must setup your route in a location where you have Wifi. However, “areas” can be downloaded for offline use. I just moved to a new city… and downloaded the whole area to my Nexus7. If I’m lost I can at least see where I am and where I am trying to go. All 3 of these tablets can use Google Maps. You can install Gmail, Google Maps, YouTube and Currents on a Kindle Fire HD without having to “root” the tablet. Since it doesn’t have a GPS chip, it just won’t be able to show your dot.